Sydney teenager Steve Solomon smashed a 27-year record in the 400 metres at last week’s Australian All-Schools Athletics meet, and is now ranked World Number Two in the under-18s age bracket. The ambitious youngster, who enters year 12 at Crankbrook next year, is eyeing the London Olympics in 2012, and after running a 46.44 last week, Solomon will spend the next two years hammering down his time. “My goal is to at least make the relay team,” Solomon, a former Hakoah YDL player and the captain of the Australian junior football side at the 2009 Maccabiah Games, told Maccabi News. Solomon expects the Olympic A qualifying time to be 45.5 seconds, with the Olympic B mark of 45.9 the target he needs to achieve to make the relay squad. So well, in fact, that he smashed the long-standing record. 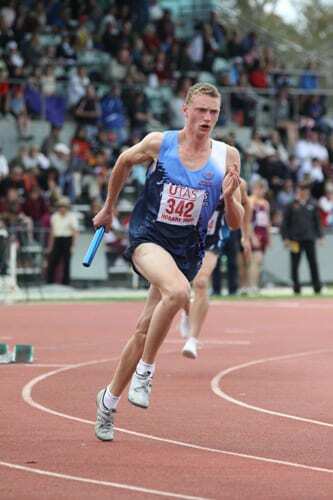 His new ranking should open doors to a NSW Institute of Sport scholarship, to go with his Athletics Australia one, and he hopes it will raise his profile to attract potential sponsors. “The record was excellent – the previous record holder was a guy called Miles Murphy, whose record I just missed at the NSW All-Schools, so I really wanted to get him”. Get him he did. With that kind of determination, talent and ambition, we’ll be behind Steve as he tries to tick off the rest of the boxes along the way.